Diecutting Supplies – Creasing Supplies – AmeriKen Online! 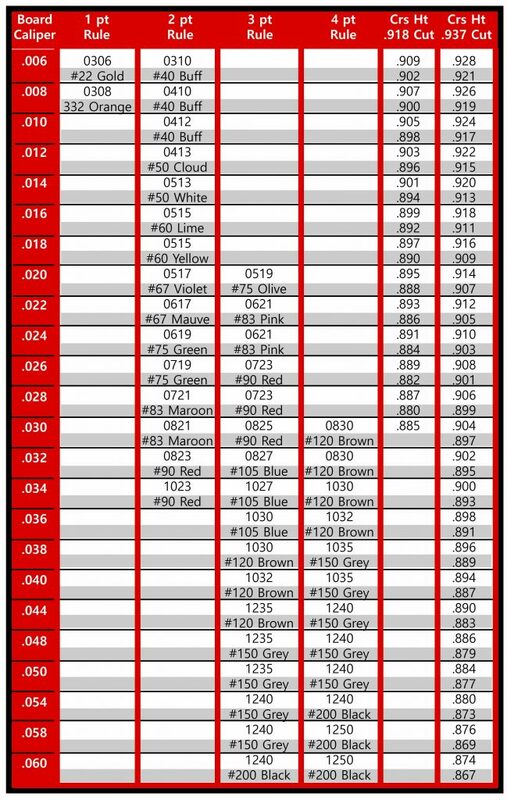 AmeriKen offers the most extensive line of creasing matrix available on the market. We also carry a variety of creasing matrix tools and accessories as well as phenolic counter material. If you do not see a product below, call your local AmeriKen representative and if it’s available, we’ll find it. Faster Makeready and Press Speeds! Longer Lasting with More Precise Creases! 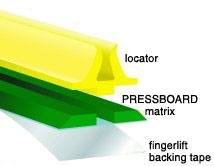 The unique ramp design eliminates taping of the edges, combine this with the aggressive adhesive, and you have faster makeready times and less downtime of the press. The exclusive ramp design and tapered channel flies the sheet through the press at maximum speeds. 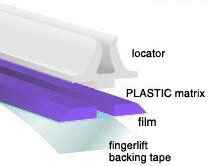 The tapered channel reduces sheet breakup and bead channel snagging, and also reduces the stress and abrasive wear of the upper corner of the channel, extending the life of the matrix and maintaining crease performance from carton to carton. Speedy Crease is available in both “metal” and “plastic” sizes. The sizing chart outlines both metal and plastic sizes, along with crease rule heights for whichever size matrix you select. Download our Speedy Crease Flyer here. ProCrease, a plastic based matrix, is manufactured using state of the art, laser-controlled technology. The matrix has excellent impact strength for longer life and engineered shoulders for faster, smoother substrate throughput. ProCrease is color coded by channel height, and both locator and matrix is printed with product dimensions, so you’ll never find yourself accidentally using the wrong size matrix. The patented adhesive-free locator bonding leaves no sticky residue, saving time and making better creases. And it’s easy to use thanks to the superior-quality finger-lift adhesive system. Scroll over the picture above to see the finger-lift adhesive system. ProCrease is available exclusively from AmeriKen. View our flyer for complete details and sizes available. Ken-Score is easily cut, mitered, and positioned! Its matrix is reinforced with a flexible steel base for optimum strength and wear resistance. To install, fit the removable locator over the creasing rule. 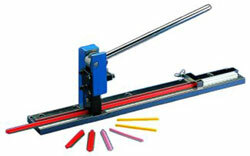 Close the press and Ken-Score easily self-locates and adheres to the cutting plate. Powerful adhesive holds the matrix securely and accurately in place. No creeping or slipping. And there’s no tedious make-ready. At the end of the run, the matrix removes easily without adhesive residue. Among its many advantages, Ken-Score matrix is tapered to allow smooth, uninterrupted feeding of any material being diecut. Ken-Score assures uniform, split-free creasing as never before! Ken-Score features beveled edges and a new channel section manufactured to exacting tolerances from an advanced thermoplastic polymer. The double-sided adhesive system from 3M offers exceptional initial tack plus adherence strength to rigidly hold during production runs of any length. Yet, when the matrix is removed at the end of the run, it lifts away cleanly without any residue on the platen. The universal patented locator easily fits on several rule sizes, eliminating the need to carry excess inventory. #250 Cream 3-4pt .250 3-4pt locator 44 .060 & up and D.W.
#250 Cream 4-6pt .250 4-6pt locator 44 .060 & up and D.W.
Pentra’s creasing matrix system utilizes ULTRA THIN press board so there is no need to calculate crease rule height adjustments in order to compensate for matrix thickness. At last, creasing matrix that does not require specialized skill. 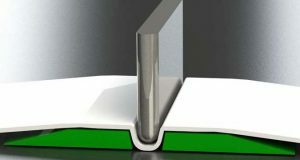 Easy finishing – matrix strips can be cut with a knife. Advanced locator instantly ensures perfect registration. The extra width of the matrix bevel assures better adhesion to the platen. It’s powerful adhesive holds it securely in place – no slipping, no creeping. The wide beveled matrix edges also allow smoother passage of board material, whether flat or corrugated. Pentra is available in pre-cut strips in all sizes. Each strip is 27″ long, with 50 strips to a box for a total of 114.8 ft. Some sizes are also available in convenient economical coils. Ask your AmeriKen representative for availability when placing your order. FIBRIX Matrix is a pressboard matrix that is easy to use and work with, reduces damage to the board, and helps to increase throughput. SYNTRIX Matrix is a fully synthetic matrix with regular film base, which gives extreme durability yet has a very competitive pricing structure. 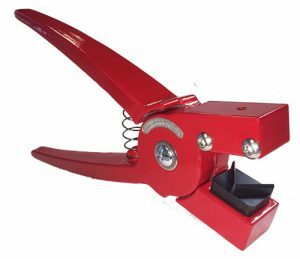 Matrix bench presses and miter pliers from AmeriKen are an essential part of your creasing tool supplies kit. Blades and anvils are also available. reinforced surface layers and a kraft paper reinforced phenolic core. Available in flex or rigid sheet and designed specifically to meet the exacting requirements of the diemaking industry. Thicknesses range (in mm): .40, .45, .50, .55, .60, .65, .70, .75, .80, .85, .90, .95, 1, 1.05, 1.10, 1.15, 1.20, 1.25, 1.30, 1.35, 1.40 with close tolerance limits of +/- .02mm.